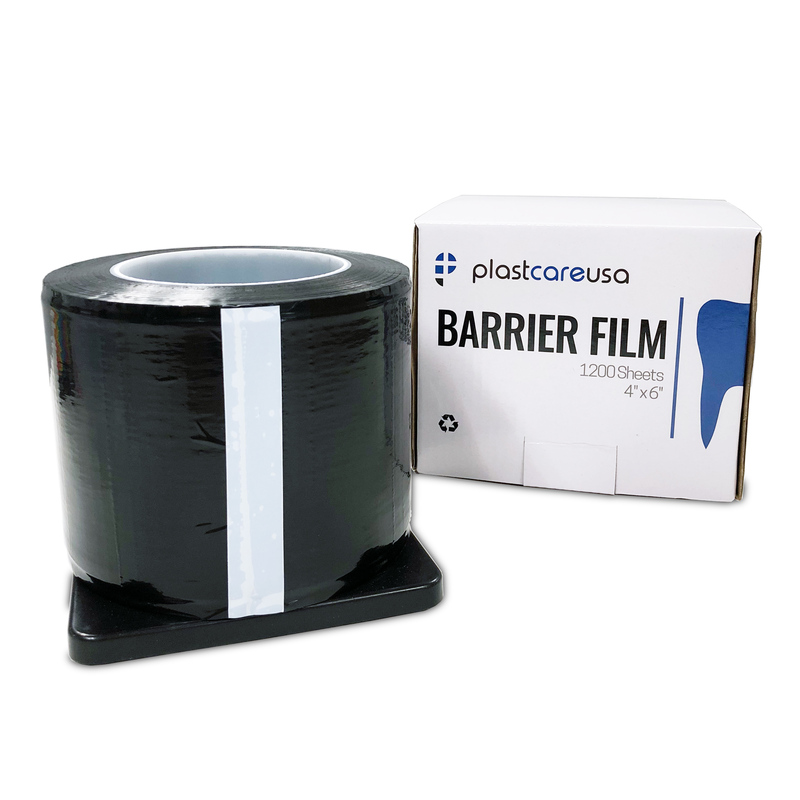 Barrier film is essentially a medical-grade plastic wrapwith a self-adhesive backing. We have made our barrier film roll dispenser easy to use by cutting it into 4” by 6” sheets that can be cut or molded into different shapes and sizes to fit the instruments or equipment they protect—water syringe handle covers, hose covers, pen sheaths, etc. Dental offices and other medical offices should be clean and sterile. Barrier film helps protect surfaces to keep them disinfected and free from environmental contaminants. These barriers are changed after each patient, so surfaces remain clean and disinfected until the end of the day at the clinic. 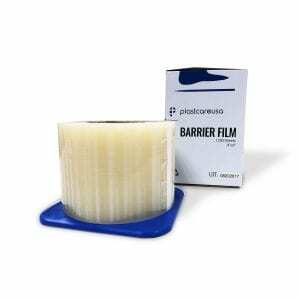 Among your other dental supplies—dentures, impression materials, tools, water syringe, etc.—barrier film should be in your office! 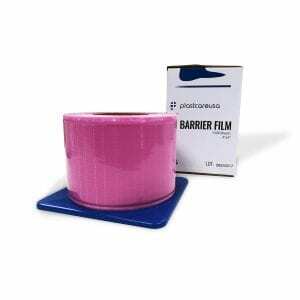 Ideal for wrapping around your materials to keep them disinfected, this heavy-duty, disposable barrier film will make cleaning between patients or at the end of the day a breeze! Keeping surfaces of dental offices and other medical offices clean is crucial to prevent infections from spreading. Surfaces can easily become contaminated throughout the day, and it’s imperative that dental offices take measures to protect every surface in the office. Barrier film is the ideal solution for protecting hard-to-reach and difficult-to-clean areas. The film is like a thick plastic wrap (similar to what you protect food with). 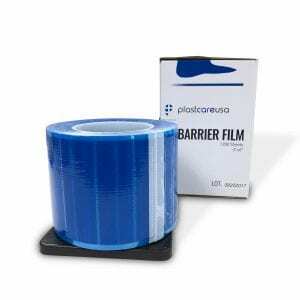 However, barrier film is made with a self-adhesive back, so it it sticky enough to adhere to any surface in the office. This sheeting roll has a plastic core surrounded by 1200 sheets of barrier film. We cut each piece to 4” by 6” and added perforated edges so they are easy to tear apart. You can even leave the roll in the box because it also includes a perforated slit to use as a dispenser. Cut the sheets into different shapes and sizes to fit exactly where you need them. Use barrier film as water syringe handle covers, hose covers, pen sheaths, and more. Cover any surface that you need to! The film can be easily applied and easily removed, leaving no sticky residue behind. To use, we recommend that you clean the surface prior to applying the sheeting. Areas that have the chance to become contaminated should be your first priority. With clean gloves or hands, disinfect the area and then place each cover so that it protects the entire surface. After a patient has been treated, carefully remove the plastic sheeting without coming in contact with the underlying surface. Apply new barrier film, and carry on with the rest of your day. Discard surface barriers after use. They can be thrown away with regular office waste (unless local laws prohibit it).